There were several noteworthy events taking place over the weekend. I made it to three of them. And I feel more cultured because of it. I started out Friday night by supporting Tiffany Jones (of Digital Divas fame) at her Woman of the Year reception at the Mint Museum, a fundraiser for the Leukemia & Lymphoma Society (you can contribute to Jones' campaign by clicking here). It was a nice event: beautiful people and great art with DJ-spun hip-hop playing in the background. There were several notable people in attendance, including Congressman Mel Watt, N.C. House of Representative candidate Nick Mackey (of Charlotte sheriff election fame), and Carolina Panthers cornerback Ken Lucas. 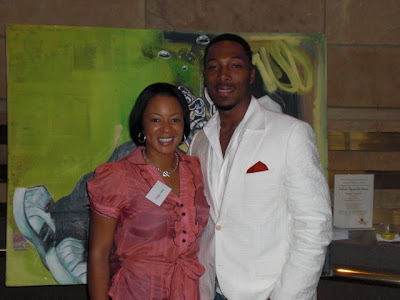 Tiffany Jones and Ken Lucas at the Woman of the Year fundraiser at the Mint Museum. The evening's proceedings included a tour of Scene in America, an exhibit that explores the black male identity through contemporary art. One of the featured artists, John Hairston Jr., was on hand. There are several intriguing pieces on display, many from young artists. The exhibit is a must-see and it is on display until November. The Mint is currently planning programming for it so be on the lookout for upcoming events. 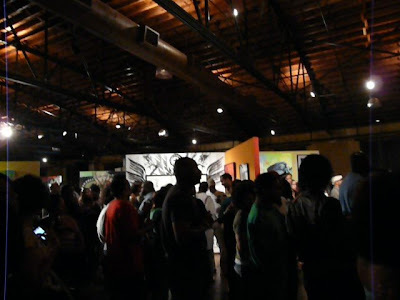 Next, I headed to the Jack Daniel's Art, Beats and Lyrics event at CenterStage@NoDa. It was just as I expected when I arrived around 9 p.m.: a ridiculous line wrapped around the building. Thank God for my media credentials, so I breezed right in (don't hate). The event reached capacity throughout the night, which I think was 700. After about 9:30 they would only let people in as others left. The event was heavily promoted and more importantly it was free (you had to register for a ticket online). Crowd in line for free Jack Daniel's drinks during Art, Beats and Lyrics at CenterStage@NoDa. There was music by DJs and live bands, B-boys were breakdancing, and there was graffiti-inspired art everywhere. It was as if I was in a scene from Krush Groove. Events like this remind me that hip-hop is the most creative art form there is. And the best of it was on display here. We need more of this to balance a lot of the garbage-filled hip-hop we're fed through the mainstream. The spotlight tonight though was on the art. There were dozens of innovative and thought-provoking pieces on display. I hope the artists gained the awareness and fanbase they deserve. They're too talented to be starving artists, and I hope they're not. 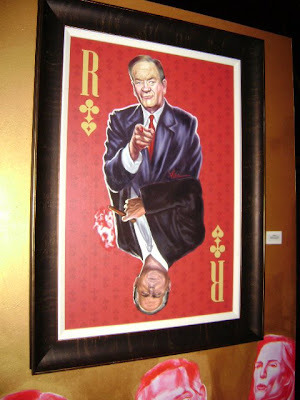 Playing the race card—a brilliant piece of art on display at Art, Beats and Lyrics. I just may start drinking Jack Daniel's now. The Art, Beats and Lyrics event ended at 11 p.m., then a group of friends and I went to Wine-Up. We figured we'd keep it in NoDa. I don't make it out to Wine-Up that often but each time I do I enjoy it. I always enjoy the laid-back atmosphere (and the drinks are so cheap). On Saturday, I attended "Get Your Money Right: Hip-Hop Summit on Financial Empowerment," presented by the Hip-Hop Summit Action Network and held at Johnson C. Smith University. There were several big names scheduled to be on the panel so I expected a large turnout. Held at JCSU's Brayboy Gymnasium, it was crowded but I don't think it reached capacity. It should have, considering the fact that many in the bling generation can benefit from being taught how to better handle their finances. It was a free event also. Of the panelists (see picture below to see who the stars were), Terrence J, Anthony Hamilton, and Bun B gave the realest and most honest answers and advice. They spoke to the audience in a way that we could relate. 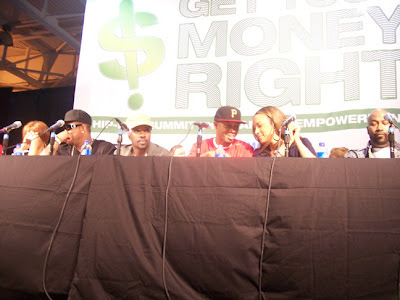 From left to right: Cheri Dennis, Gorilla Zoe, Anthony Hamilton, Terrence J, Valeisha Butterfield, and Bun B were among the celebrity panelists at the Hip-Hop Summit. Not pictured is DJ Drama, who was seated on the second row. Here are a few memorable lines from the panelists. Hamilton said to "pay your taxes and your tithes" and to "stay out of jail and stop having babies that you know you can't afford." Bun B told the audience to stop overextending themselves trying to keep up with the next man. "I want to be on Russell Simmons' level one day, but I'm not even in his tax bracket," Bun said. "If I wreck my Rolls Royce, I'll be crying like a little girl. If Russell wrecks his, he'll just go get another one." Bun also explained how much artists make off of record sales, for those who think rappers get rich overnight and don't understand that they are often indebted to their record companies. Terrence J let the audience in on a little behind-the-scenes 106 & Park stuff. "Don't be fooled by the jewelry you see these rappers wearing on TV, because half of it is fake and the other half is rented." Terrence said he's stopped wearing jewelry on the show because he doesn't want young people to feel like it's something they have to have. Welcome to "Grown People Talking"